7 photographs and 1 negative. Albert Pettitt was born in Kent, England in 1876. He immigrated to Canada in 1892 and settled in Brandon, Manitoba to work as a farmhand for his uncle George Palmer and later for Harry Sutton and Tom Kneeshaw. He married Marian Kneeshaw in 1902 and the couple established their own farm. During the First World War, Albert served with the 1st Canadian Mounted Rifles. He was also a barbershop singer and a long-time member of the First Presbyterian Church Choir and Brandon Lodge No.19. Mr. Pettitt passed away in 1975 and is buried at the Brandon Cemetery. Daly House Museum in accessioned the collection in 1986. Prior custodial history is unknown. The collection is comprised primarily of photographs from the early Brandon Hills farming community. These photographs include Rev. 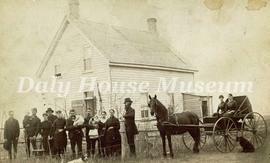 George Roddick’s farm, Henry Dunbar’s threshing outfit, Robert Dunbar, and a school house. 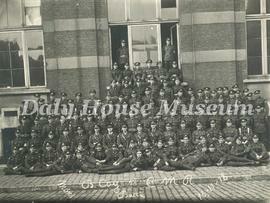 The collection also includes a photograph of the 1st Battalion Canadian Mounted Rifles from the First World War. Researchers are responsible for copyright requirements.